The domestic life insurance business is one with particularly high growth potential among Group businesses. We will accelerate growth by providing products and services of choice to customers. Major products include “Shin Kenko no Omamori”(released in May 2014) and “Shin Kenko no Omamori Heart” (released in April 2015). Both of these products have proved immensely popular among customers, with a combined total of 1,000,000 applications for these products since their launch. We provide a wide range of insurance products that cover customer risks in response to changes in the social structure surrounding the customer and in their lifestyle. We are realizing growth in keeping with efficiency and profits through product strategies that focus on high-margin protectiontype products, such as medical insurance and income compensation insurance, and sales strategies that make maximum use of our network of P&C insurance agencies. 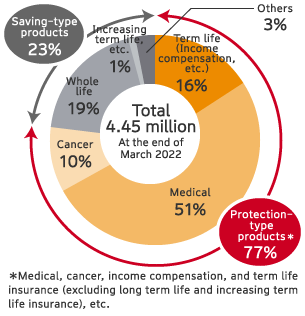 Sompo Japan Nipponkoa Himawari Life Insurance, Inc. has donated \3 million each to Japan Organ Transplant Network and Medipolis Medical Research Institute, with the donations timed to coincide with sales of Linkx coins surpassing 15,000 policies. Launched in September 2016, Linkx coins (pronounced “Link cross coins”; official name: insurance for advanced medical treatment with organ transplantation medical treatment benefit) is an online-only product that customers can enroll in for a monthly premium of \500. Linkx coins is an insurance product that focuses on covering conditions that put the greatest financial burden on the insured when undergoing treatment, such as advanced medical treatment and organ transplant. As part of its CSR activities, Himawari Life has decided to make donations to a medical institution and promotional organization involved in advanced medical treatment and organ transplant, respectively, based on the number of policies sold. This initiative aims to realize a society where everyone has access to medical treatment using highly costly advanced medical technologies. Sompo Japan Nipponkoa Himawari Life Insurance, Inc. has received the “Award for Excellence of the Director-General of the Health Service Bureau” and the “People’s Smart Life Award,” in which the winner is decided by a vote of the general public, in the Corporate Segment of the Lifestyle Diseases Category of the “6th Smart Life Project Award (Let’s extend healthy life expectancy! )” These awards are organized by the Ministry of Health, Labour and Welfare. Under the Mid-Term Management Plan, Himawari Life is committed to evolve into a health support enterprise that helps people achieve good health. To reach this goal, the company believes it is essential to start with maintaining and enhancing the health of the company’s employees and their families. Based on this belief, the company has taken initiatives such as distributing wearable fitness devices to employees, and prohibiting smoking throughout the head office and sales branches. The awards were received in recognition of these initiatives. In June 2017, Sompo Japan Nipponkoa Himawari Life Insurance, Inc. and Money Forward, Inc. commenced a business alliance to create innovative services by integrating Himawari Life’s expertise in life insurance and Money Forward's technologies. The goal of the alliance is to provide services that alleviate any concerns and unease customers may have about money. In November 2017, the two companies rolled out “Linkx Household Accounting,” a household accounting app that lets users manage household accounts and assets in one place, thereby making the flow of money clearly visible. This app is also available free of charge to users other than policyholders of Himawari Life. The “One-Time Hospitalization Benefit” and “Outpatient Treatment Benefit” were launched on November 2, 2017. They can be added to medical insurance (2014) and medical insurance (08)*. Moreover, a special “One-Time Hospitalization Benefit Same-Day Payment Service” was launched exclusively for the “One-Time Hospitalization Benefit Rider.” This service enables customers to receive the one-time hospitalization benefit from the rider on the same day they are admitted, provided they contact the Company or an agency beforehand. Promotion of Health Service Brand "Linkx"
As a leader in "security, health, and well-being," Sompo Japan Nipponkoa Himawari Life Insurance aims to transform itself into a health support enterprise that assists customers in improving their health, as the natural evolution of a life insurance company. To that end, we have been promoting our Linkx health service brand since September 2016. We provide revolutionary products revolving around health and health-related services centered on apps under the brand, which is rooted in the concept of making healthy living pleasant and fun for customers. Under the Linkx brand, we have currently released four apps, all of which are also free for use by non-policyholders. 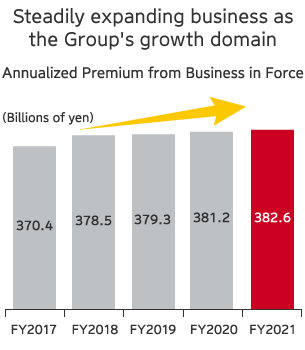 Sompo Japan Nipponkoa Himawari Life Insurance, Inc.
A life insurance company that offers advanced products and services as the growth engine of the Group.